That was the title of a blog post, last updated on January 8, 2010, by Understanding The Market – Capire Il Mercato. In a note, the author, Cole Kendall stated, “I will make the calculations in a way that provides a “best case” to the Obama team.” Since Mr. Kendall decided to give up on his tracking operation at the end of 2009, I decided to finish it off. Using the same criteria as outlined by Obama’s (now former) economic team, jobs are defined by taking the “Establishment Data” figure from Table B-1 [seasonally adjusted] of the Bureau of Labor Statistics – Employment Situation Report. Instead of boring you with the month-by-month data for 2010, I went ahead and cut to the chase, skipping from December of 2009 – where Mr. Kendall left off, to September of 2010 – the latest data from the 10/08/2010 report. The conclusion is pretty grim, and certainly doesn’t mesh with what Obama has been saying out on the campaign trail. 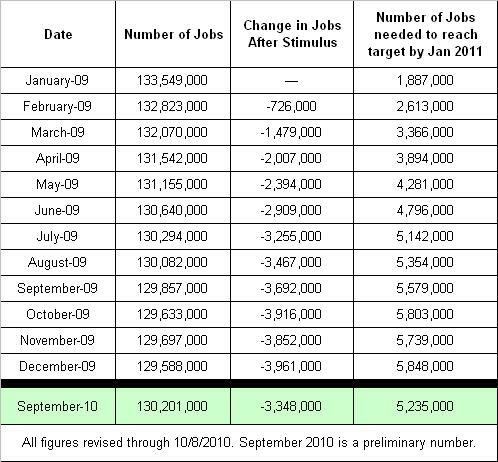 The sad truth is that instead of creating 3.5 million jobs since the stimulus plan was passed, the plan has resulted in the loss of 3.3 million jobs. Since the stimulus plan was supposed to save 1,613,000 jobs in addition to creating 1,887,000 jobs, and since it actually resulted in the loss of 3,348,000 jobs, it would now take the creation of 5,235,000 jobs, by January of 2011, to reach the original target.